The site offers a suite of tools for affiliate marketers, including an automated bonus delivery system (offer a bonus to people who buy through your affiliate link, and have it delivered without your having to manually verify that you got the commission and email it out), hover ads that you can place over other people's websites, ClickBank research data, a meta search tool to help you find content and products to promote from a variety of sources all at once, and more. 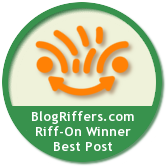 The winner also gets bragging rights and the right to display the winner badge on their blog post. Read this post by Terry Dean. Write a Blog Riff on it -- ie. quote a brief section of it on your blog, and publish a post based on the quote (tip don't try to cover the whole article -- pick one idea and "riff" on it). Be sure to give proper credit for the quote -- ie. link to Terry's post from yours. Don't just regurgitate or rephrase what Terry said -- your post should be primarily composed of your own original thoughts, research, etc. If you'd like to see a few examples of how to write a Blog Riff, visit my blog (White Hat Crew). Over half of my blog posts are usually Blog Riffs, so you shouldn't have any trouble finding several posts containing quotes marked with the Blog Riffers icon. To learn how to make your Blog Riffs more powerful, sign up for my mailing list, and I'll send you a five-part tutorial on high-impact Blog Riffing. Once all the entries are in, I'll read them all and announce a winner here on the blog, and I'll give them their free year of Instant Affiliate Accelerator. First, don't think that you can't win. We only had a handful of entries in our first contest, and it may take us a few times through to really get things rolling. So now, before we start pulling in too many competitors, is prime time to go for it! Second, please spread the word about the contest! Let's have some fun with it -- see how many blog posts we can generate -- see if we can get Terry's attention -- etc.